A quick look at Dublin trams (and no, not the LUAS) | Come Here To Me! There was a time when transport by tram around Dublin wasn’t restricted to two bizarrely unconnected routes, when tramlines extended miles in every direction, spreading from O’Connell Street outwards like arteries from a heart to Dublin’s rapidly expanding suburbs. Three companies operated the trams initially, the Dublin Tramways Company, the North Dublin Street Tramways Company, and Dublin Central Tramways. These companies united in 1880, forming the Dublin United Tramways Company, with 137 trams running routes which totaled over 32 miles. The last horse tram ran in January 1901, by which time Dublin had completely electrified it’s system, now with 66 miles of track, of which nearly 50 were owned by the DUTC. 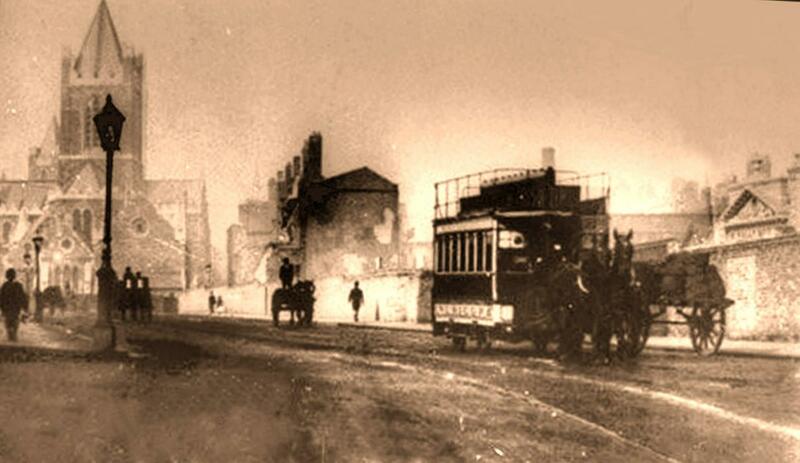 The first tram came into service in February 1872, and ran from College Green to Rathgar. The trams generally operated within the City Centre or stretching to the more affluent South Dublin suburbs. Traveling on the trams, in the early days at least, was a luxury only Dublin’s white collar workers could afford. 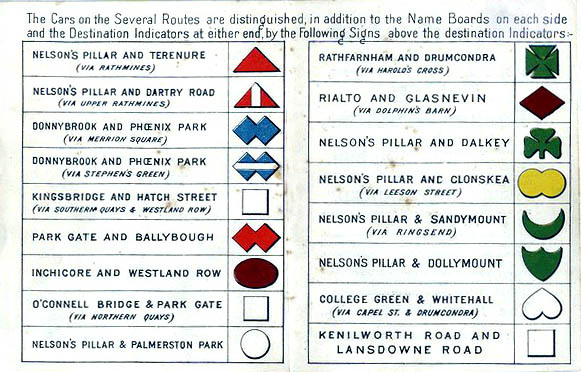 The majority of trams started at, or stopped nearby Nelson’s Pillar, and their terminus’ stretched to the likes of Sandymount, Blackrock, Dun Laoghaire, Dalkey and Terenure, as can be seen on the route identifier above. As well as featuring in a high percentage of photo’s of Dublin streets at the turn of the last century, they played parts in the Easter Rising, being toppled and bombed and their wreckage used for barricades, and feature in Joyce’s Ulysses. For over twenty years after the introduction of electric trams here, Dublin was a pioneer in tram building, the works in Inchicore churning out carriages whose design would be copied worldwide. But the introduction of the car to Irish roads, the growth in their use in the twenties, and the newly designed four wheeled “bogey,” or basically a precursor to the bus saw the abandonment of many trams. The last tram in Dublin City ran on on 9th July 1949, with the Howth Head line lasting another ten years before it too succumbed to progress. Some of their lines can still be found around the city, relics of a time past. A copy of the Dublin United Tramways Company from 2010 has been uploaded by the National Archives of Ireland and can be found here. 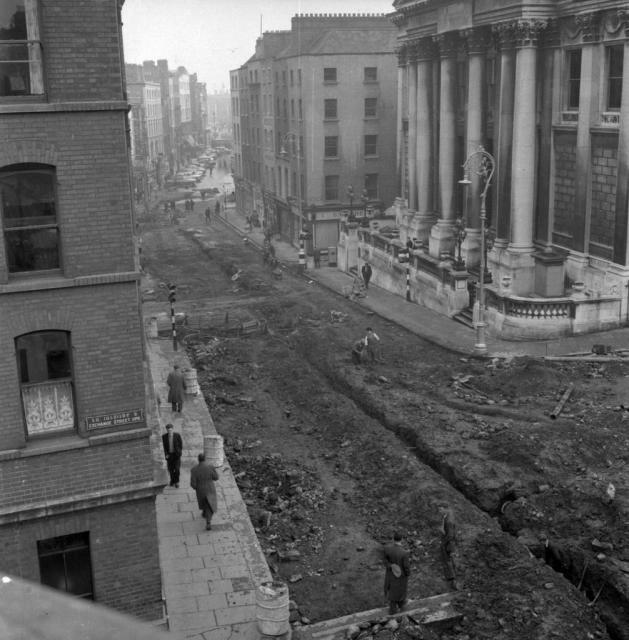 The image of workers removing the tracks from Cork Street is from the Dublin City Council’s Photographic Collection. Just dropping by to say – good post – yet another in this bloody excellent blog. Enjoying receiving the email updates. Will sing your praises at my own place when I catch up with myself. I think I’m right in saying that the numbers were a substitute for the symbols, not an addition. The system at the point of numbering can still be determined from bus numbers: 1 (Pigeon House) goes to the east-sou’-east, 2, 3, 4 etc. to the south-east, round to 30-something going east-nor’-east. My father and his pals used to cycle beside the trams. There was a rope which held the trolley onto the overhead electric rails. They would undo the rope and yank it-thus sending the trolley up into the air and the end of the rope with it. The tram would grind to a halt and they would cycle off leaving it stranded!. Would it be possible to link to our website in a similar way that you did for the story on ‘Red Reminisences’? “What must have been the 21 tram to Inchicore” – this is Lord Edward Street, looking at Christ Church: https://www.google.ie/maps/@53.3439846,-6.268055,3a,75y,263.15h,94.22t/data=!3m6!1e1!3m4!1srL8nTfsUBD1ImdPKNrVNyg!2e0!7i13312!8i6656 Note that Lord Edward Street is only about 110 years old. Last DUTC trams ran in July 1949 on 6(Blackrock), 7(Dun Laoghaire) and 8(Dalkey).